This is part 5 of 5 in a multi-part series about what I call the Tetris Moment in storytelling. There will be spoilers for important plot points of Code Geass in this essay. The first season of Code Geass was a bright, shining example of how great execution could elevate a show laden with fan service and product placement to astonishing levels. Always finding the right balance between camp and honest drama, the show’s hamminess actually increased my enjoyment and emotional engagement. When Code Geass came back for round two, this was no longer the case. Taking everything up to eleven minus the actual plot, the series began to suffer from what felt like a growing pathological need to hit its viewers over the head with multiple big reveals and shocking twists per episode instead of allowing for the necessary breathing space to reap the emotional payoff afterwards. With the last episode drawing closer, I began to worry if the people behind the curtain had any plan how to steer this ship into port – or if Code Geass would succumb to another case of Lost syndrome. Luckily, there was no need for me to be concerned, as Code Geass came back on track and into port with a bang. Just as Lelouch vi Britannia, freedom fighter turned dictator, is about to execute his former merry band of revolutionaries, hope appears on the horizon. Revolutionary leader Zero is back, but how is that possible, given that Lelouch himself used to be Zero before he exchanged the vigilante’s mask for the imperial crown after apparently turning evil? Kallen, his former knight and one of the people lined up to be executed, is the first to see through the plot about to unfold. Which is, of course, just as theatrical, excessive and melodramatic as it should be within the context of this series. The one who picked up Zero’s mask is Lelouch’s old friend turned mortal enemy turned retainer Suzaku whom we, just like Kallen, presumed to be recently deceased. 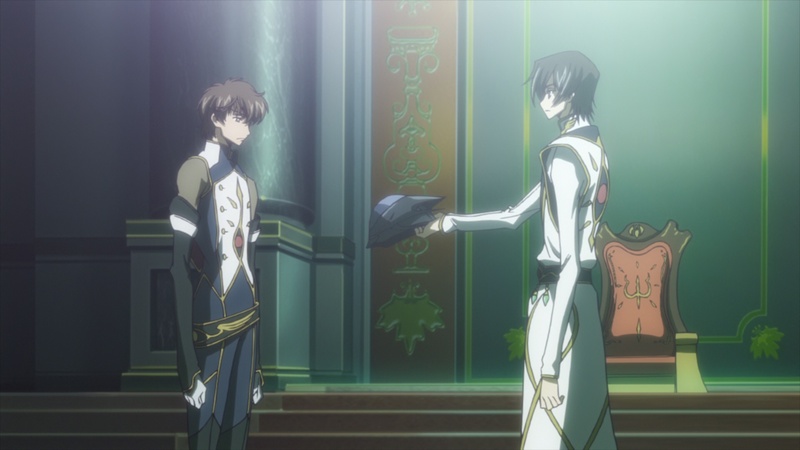 In the series last and most perfect twist, Lelouch and Suzaku conspired to turn Lelouch into an icon of hate for Suzaku to kill and unite the war-torn world behind the mask and idea of Zero. Lelouch dies a secret martyr, while Suzaku gets his wish to avenge the love of his life, with the added catch of being cursed to live on as Zero and sacrifice any possibility of personal happiness. But it’s not just the series’ return to personal drama with a capital D followed by several exclamation marks which makes this a perfect Tetris Moment. The moment when Zero’s silhouette appears on the horizon, the audience knows who’s behind that mask and what’s going to happen. And how this was the only possible ending for the series from the beginning. 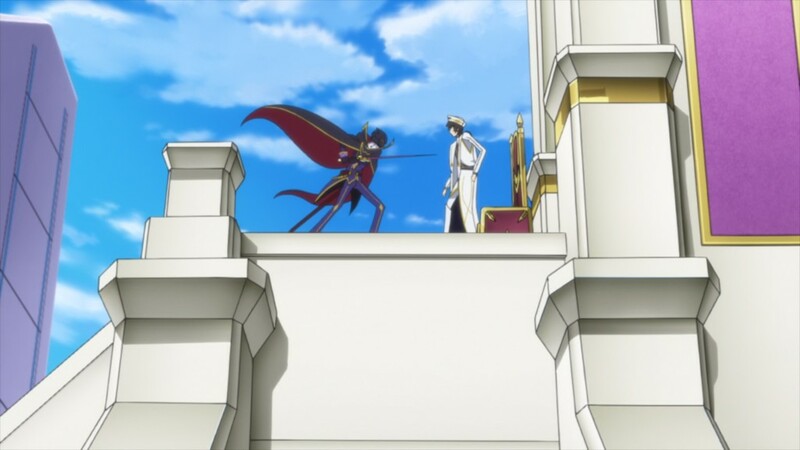 Lelouch, who had always claimed to accept the consequences of his actions, finally gets to pay the price for his ambition. Suzaku, the guilt-ridden death seeker, gets cursed to live on, adding one more death to his already heavy conscience. They were meant to end up like this. The fact that this inevitability only becomes clear in retrospective makes the moment of realization all the more satisfying. 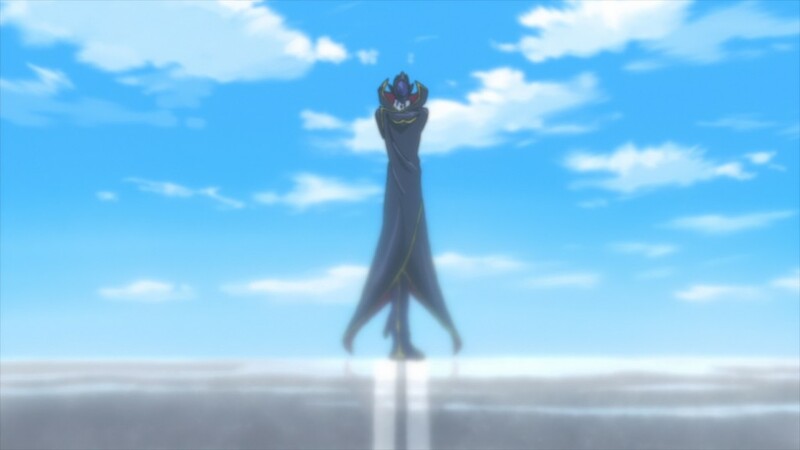 In that moment, all the flaws (of which there were many) of Code Geass‘ second season are temporarily forgiven. Sitting back, we are finally able to “enjoy” the emotional payoff, as the tragic, but perfect farce of Lelouch’s assassination plays out in front of us. As it turns out, they really did have plan, after all, and a bloody good one at that. It isn’t a good plan at all. It is nothing more than a glorified suicide. Writers attempt at giving us a happy ending gave us this stupidity. Lelouch instead of taking responsibility simply dumps all the worlds problems on Nunnally and Suzaku’s laps and turn both their lives even more horrible cowardly ends his life.